For indulgence direct to their inbox within five minutes of purchase, opt for an e-gift card—personalised with your own special message.The MECCA E-Gift Card is the ultimate gift for any beauty buff. 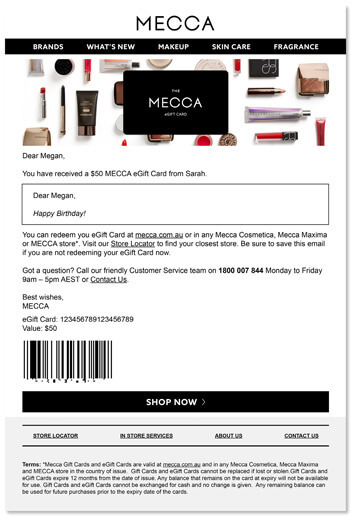 Spoiled for choice, let them curate their own MECCA experience at mecca.com.au or any Mecca Cosmetica, Mecca Maxima or MECCA store. 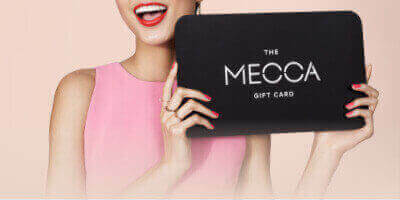 Terms: *Mecca Gift Cards are valid at mecca.com.au and in any Mecca Cosmetica, Mecca Maxima, and MECCA store in the country of issue. Cards cannot be replaced if lost or stolen. Cards cannot be exchanged for cash and no change is given. Any remaining balance can be used for future purchases. Gift Cards can be purchased to the value of any in-store service.